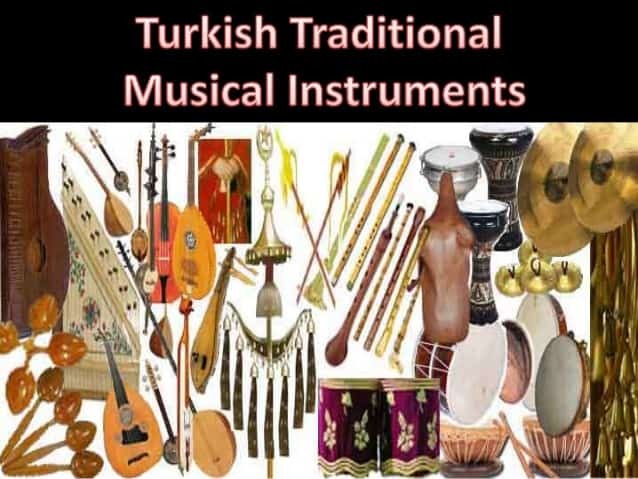 Turkey has a wide diversity of musical instruments, some of which have existed there for over a thousand years while others have been imported in our own times. Ancient instruments in common use are flutes, oboe instruments, fiddles, lutes and drums of various kinds. The clarinet, the accordion, brass instruments and the violin are among the instruments introduced more recently form other countries. Art music and folk music use separate instruments. The instrumental repertoire of art music is coherent and well defined. Folk music, on the other hand, presents a host of local instruments. Sometimes one and the same instrument will be called by different names in different parts of the country, and sometimes instruments which are completely different can bear identical names, a problem encountered by specialists in musical instruments in most countries. It would be impossible here to describe all the instruments played in Turkey, but here is a concise presentation of some of the commonest. Art music instruments Ney – a fipple flute held vertically. The name means “bamboo pipe”, which tells us what the instrument is made from. The ney comes in many different sizes. It has six simple finger holes in front and a thumb hole behind. There are no keys. Sometimes the ney will be provided with an ivory, ebony or cow-horn support for the player’s underlip. Tanbur, tambur or tampur – a lute with a neck that is over a yard long. The sound chest has a rounded back and is covered with skin There are two types of tambur; yaylı tambur that is a string tambur, it has leather on the cover but the usual tambur is without skins. The tanbur has eight strings tuned in pairs. This is the instrument ranking highest in art music, and it should not be confused with the popular tanbura saz. Kud – small metal drums played, in pairs, with sticks. Bendir – a large tambourine, about 60 cm in diameter. The player holds it in his left hand, close to his face, and strikes it with his right hand. Zil – cymbals between 20 and 60 cm in diameter. Cymbals are mainly used in martial music. This Turkish instrument has spread all over the world, and the Turks are still well-known as the makers of the world’s best cymbals. Zurna – a wind instrument resembling the oboe, the zurna is made from a slightly curved piece of wood. The double reed is of bamboo. Just below the reed is a round metal plate. The player puts the whole of the reed in his mouth and rests his lips against the metal plate. This technique of playing oboe instruments (also known as shawns or schalmeys) is commonly employed in all the Asian countries. Zurna players have a breathing technique which enables them to breath in through the nose while continuing to blow from the mouth. In this way a zurna player can keep going for half an hour without even pausing to take breath. The zurna plays an important part in village festivals and is almost invariably combined with the davul. It also used to be an important military instrument. Mey – is a double reed instrument from eastern Anatolia. Kemençe – sometimes termed karadeniz kemençe to distinguish from an art music instrument called kemençe rumi – a small stringed instrument with an oblong sound box, a very short neck and three strings. The whole instrument is only about 40 cm long. The kemençe is suspended vertically in front of the player’s chest. It is only common along the shore of the Black Sea, and Kara Deniz means “Black Sea” in Turkish. Iklie or kabak kemane – a stringed instrument with a long neck and a sound box of coconut shell covered. Saz – with skin at the front and left open at the back. The iklie has three strings. It is a variant of the Arab “spearhead fiddle”, which gets its name from the metal point at the bottom of its sound box. The player supports the instrument on his knee when performing. Bağlama – is the general term for long-necked lute instruments with oval wooden sound boxes, they are played with a plectrum. The divan saz, with its metre-long neck and eight strings, is the biggest of these lutes, and the smallest is the cura saz, which has only three strings. Other vatiants are meydan saz and tanbura saz. These instruments are most commonly played in Anatolia. They are used both for folk music and for modern popular music. Sometimes they are simply called saz, which really means “instrument”. This is perhaps a reflection of the importance of lute instruments in Turkish folk music. All of the instruments in the bağlama-family have three string, but double: Two, two, two (upper, middle, under like cura saz). Or three, two, three (upper, middle, under like Divan saz). Or two, two, three (upper, middle, under is common). Davul – a big, round drum with two membranes. The davul is the ancestor of the Western bass drum. It is beaten with a stout stick in the right hand and a more slender one in the left hand. Def or Tef – a tambourine-like instrument with small cymbals built into its frame. Tulum – A Turkish bag pipe. Tulum is most common in the areas around the Black Sea. The instrument has no drone pipes, but is equipped with two parallell shanters (melody pipes). Tulum belongs to the Eastern European bag pipe family, to which also the Swedish bag pipe belongs, and has a simple reed. Sipsi – A folk clarinet made of wood, bone or quill from a bird. The instrument often has a simple heteroglott (separate) reed and is played with circulation breathing. Sipsi exists in the whole of Turkey, but is most common in the southwestern parts. Zil – Turkish finger cymbals that are played in pairs, attached to the thumb and index finger. The term zil means “cymbal”, but is most commonly used for small finger cymbals (compare the art music instrument Zil above). Cura – Refers to cura saz (see Bağlama above). Gayda – is the term for bag pipe in Bulgaria and Macedonia. (In Sameyda the Bulgarian bag pipe is played.) The gayda, like other eastern European bag pipes, has a melody pipe and a drone pipe with a simple reed. The bag is made of goat- or sheep skin. Darbouka – is the term for goblet drums in Turkey. This type of instrument is common in the Balkans, the Middle East and in North Africa. Other terms being used for this type of instrument are tarabouka, doumbek and tablah. Typical for the Turkish darbouka is that, unlike the Arabic tablah, it has a sharp edge at the top of the drum where the skin is attached – this makes it easier to play rhythmical variations with finger playing. Tar – is a Turkish long neck lute with roots in Persian music tradition (see Bağlama above).